-Cassette version of this mini-album produced by Hammerbund from Germany. -Well performed old school Death Metal from France. -Debut full length album by this old school Death Metal horde from France. 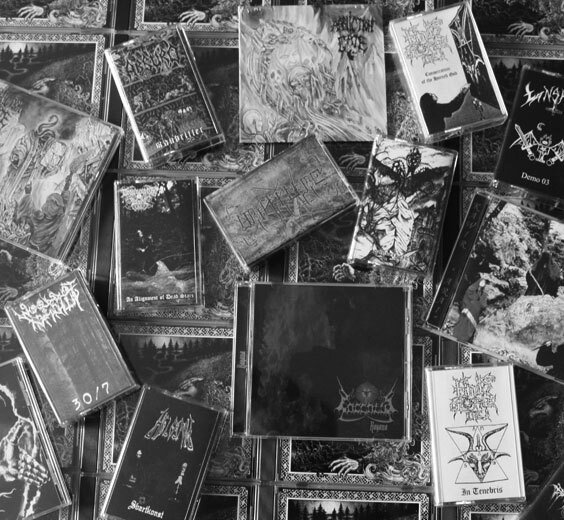 -Anguished atmospheric Black Metal from Australia. -One of the most underrated German Black Metal album, highly recommended! -An underground classic now available on cassette. -Very few copies in stock. -Back in stock! Amazing French Black Metal, highly recommended! -Raw, crude and depressive Black Metal from Australia. -Accoustic Folk music from this mysterious underground creation. -Another cassette of accoustic Folk music. -Presented as a whole instrumental manifest, cold, dark and majestic Black Metal from Sweden. -Dark, mysterious and melodic Swedish Black Metal. -Raw and primitive Black Metal from Sweden dealing with dark germanic heathenism. -Quality photocopied magazine featuring reviews and interviews with Ignivomous, Durazis and Pollution. -Cult Black Metal from Greece. -Ambient/Drone from the mastermind of Forest Grave. -Four messages of black proselytism resulting from reflections about Nothingness and Final Salvation, destined to glorify the Unique and to remind you how unfathomable His splendour is. -Reissue of this classic Lithuanian Black Metal classic. -Reissue of their promo tape from 1994, recommended! -Brand new album, simply mandatory. -Pure Transylvanian Black Metal with galloping riffs, folk-induced harmonies, atmospheric acoustic parts, depressive visions and true feeling. -Raw and malevolent Black Betal performed with a tangible conviction to destructive occult magick and entities. -Swedish Black Metal on Mystery of Death Productions. -Four unreleased tracks from one of the most weird and chanllenging horde of Sweden.